Go to original pattern for design DROPS 102-25. 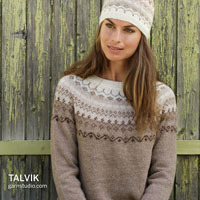 DROPS Hat and gloves in ”Silke-Alpaca” with cables and bubbles and crocheted edge. Colour no. 6305, blue: 250 g to both sizes. DROPS Circular needle (40 cm) & Double pointed needles size 3,5 mm - or needle size needed to make 19 sts x 25 rows in stocking stitch on 10 x 10 cm. DROPS Crochet hook size 3,5 mm– or hook needed to get 17 dc in width on 10 cm. 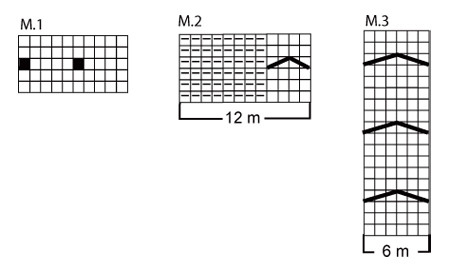 Pattern: See diagr M.1, M.2 and M.3. Crochet info: First dc on every row substitutes by 1 ch. Every row ends with 1 sl st in ch in the beg of row. 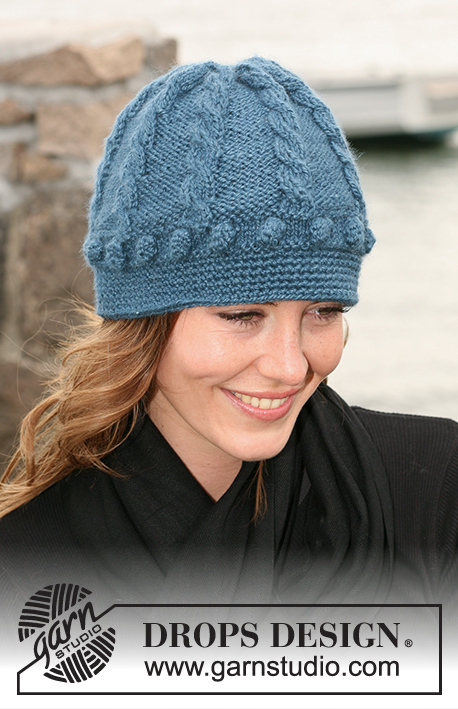 Hat: Knit in the round on circular needle. Cast on 90-100 sts on circular needle size 3,5 mm with Silke-Alpaca. K1 round. Then P1 round at the same time inc 10 sts evenly distributed = 100-110 sts. Work diagram M.1, then P1 round. K1 round at the same time inc 8-10 sts evenly distributed = 108-120 sts. Continue with M.2. At the same time when piece measures 5 cm dec 1 sts in every other P part. When piece measures 8 cm dec 1 sts in the remaining P parts = 99-110 sts. When piece measures 11 cm dec 1 sts in every other P part. When piece measures 14 cm dec 1 sts in the remaining P parts = 90-100 sts. Continue until piece measures 15-16 cm. Now work 1 round where all P sts purls tog 2 by 2 = 63-70 sts. Change to double pointed needles when the sts can’t fit on circular needle anymore. On next row knit all K sts tog 2 by 2 = 45-50 sts. K1 round at the same time all sts knits tog 2 by 2 = 23-25 sts. Pull tread through the remaining sts, pull tog and fasten. Crocheted edge: Crochet 90-100 dc with hook 3,5 mm along cast on edge on hatn - read Crochet info! Work 1 round with dc at the same time dec 6-10 dc evenly distributed = 84-90 dc – dec by skipping 1 dc. Continue with 1 dc in every dc until the edge measures approx 3 cm. Cut and fasten the thread. Increase tip (applies to thumb): Inc by yo, on next row P yo twisted to avoid holes - i.e. work in back loop instead of in front. Purl the inc sts. 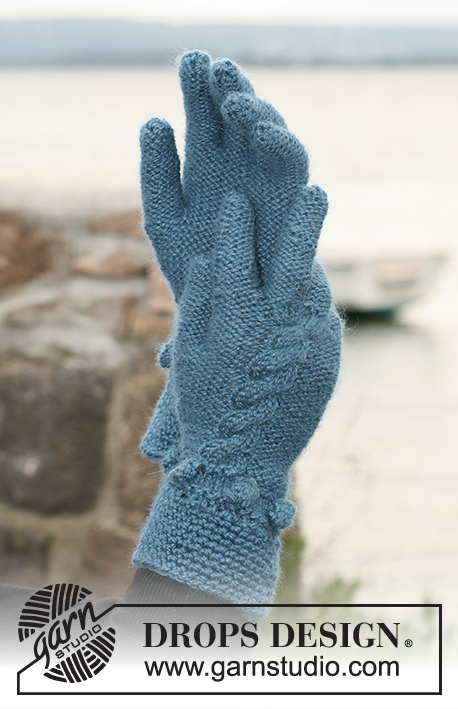 Left glove: Knit in the round on double pointed needles. Cast on 30-35 sts on double pointed needles size 3,5 mm with Silke-Alpaca. K1 round and then P1 round. Continue with M.1. When M.1 is knitted for 1 vertical repeat P1 round. Then K1 round at the same time inc 4-3 sts evenly distributed = 34-38 sts. Continue like this: P6-7, M.3 (= 6 sts) and P22-25. At the same time when piece measures 5-6 cm inc 1 sts on each side of next to last st on round for thumb: inc on every 4th round a total of 3-4 times – read Inc.tips = 7-9 thumb sts. When piece measures 11-12 cm put the 7-9 sts + 1 sts on each side (= 9-11 thumb sts) on 1 thread or stitch holder. Then pick up 3 new sts behind thumb sts = 34-38 sts. 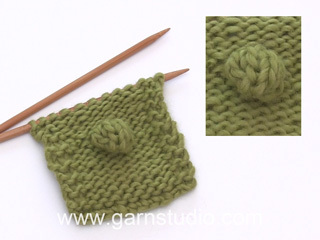 Continue until piece measures approx 15-17 cm (make sure you have knitted at least 1 round after a twist in M.3). Slip 14-16 sts on a thread or stitch holder(=on top of hand), keep the next 7-8 sts on needle and slip the last 13-14 sts on another thread or stitch holder (= inside hand). Little finger: = 7-8 sts, cast on 2 new sts towards sts on threads = 9-10 sts. 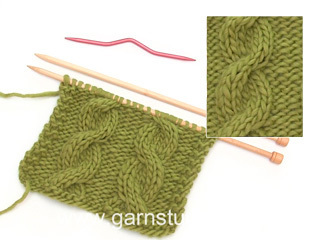 Knit stocking stitch in the round for 5½ -6½ cm, then knit all sts tog 2 by 2. Cut the thread and pull through the remaining sts, pull tog. Hand: Put sts from threads or holders back on needle, in addition pick up 2 sts towards little finger = 29-32 sts. Work 2 rounds in stocking stitch. Keep the 2 new sts towards little finger + 4-5 sts on top of hand and 4-4 sts iside hand on needle. Slip the remaining sts back on each thread or holder (10-11 sts on top of hand and 9-10 sts inside hand). Ring finger: = 10-11 sts, cast on 1 new st towards sts on threads = 11-12 sts. Work stocking stitch in the round for approx 7-8 cm, then knit all sts tog 2 by 2. Cut the thread and pull through the remaining sts, pull tog. Middle finger: Slip 5-5 sts from the thread on top of hand + 4-5 sts from the thread inside hand back on needle, in addition pick up 2 sts towards ring finger and cast on 1 new st towards sts on threads or holders = 12-13 sts. 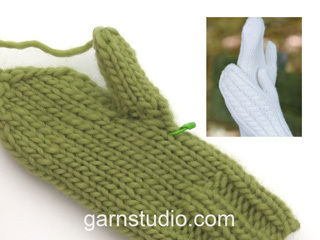 Knit stocking stitch in the round for approx 7½-8½ cm, then knit all sts tog 2 by 2. Cut the thread and pull through the remaining sts, pull tog. Pointing finger: Put the remaining 10-11 sts from threads or holders back on needle, in addition pick up 3 sts towards middle finger = 13-14 sts. 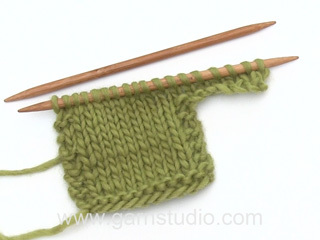 Knit stocking stitch in the round for approx 6½-7½ cm, then knit all sts tog 2 by 2. Cut the tread and pull through the remaining sts, pull tog. Thumb: Put sts for thumb on needle and in addition pick up 3 sts in edge behind thumb sts = 12-14 sts. 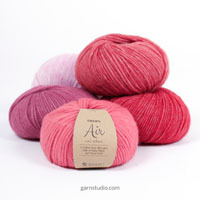 Work stocking stitch in the round for approx 5½-6 cm, then knit all sts tog 2 by 2. Cut the thread and pull through the remaining sts, pull tog. Crocheted edge: Crochet 30-35 dc with hook 3,5 along cast on edge. Then crochet 1 dc in every dc – read Crochet info – until edge measures 6 cm. Cut and fasten the tread. Right glove: Work as left but reversed, i.e. after M.1 knit like this: P22-25, M.3 (= 6 sts) and P6-7. Inc for thumb on each side of second st on round, instead of the next to last. = Bubble - Knit like this in the same st: P1, YO, P1, YO, P1 (= 5 sts), turn piece. Work 4 rounds in reversed stocking stitch over these 5 sts. Then slip second sts on right needle over first st, then slip 3rd st over first st, then 4th st over firsts and at last slip 5th st over first (= 1 rem st). = Cable: Put 2 sts on cable needle behind work, K2, K2 from cable needle. Jättefin! Kanske en mössa som även jag skulle kunna ha? Ta med den!! Snyggaste mössan en klar favorit. Måste bara med. Väldigt snygg, blir dessutom extra fint i silka alpaca.